From time to time FundSoft may have some MetaStock Technical Analysis Software products that are on clearance, and you will find them here. The ETS MetaStock addon is a complete trading system with buy/sell entries, protective stops, trailing stops and profit targets. With each trade know the precise entry level and whether you are going long/short, how much risk exists and when to exit. ICE allows you to create powerful and personal trading systems for MetaStock - with NO formula writing and NO computer programming. It allows you to focus on the creative aspect of building a trading system not the mathematical and technical aspects. Jake Bernstein’s technical signals include a collection of Jake’s favorite trading methodologies. They are designed to work with Stocks, Futures, and Forex. These systems will give you crystal clear entry points, stop losses, and profit targets. PowerPivots Plus allows you to pinpoint the best time to get in a trade. It uses proprietary algorithms to evaluate the market's current trend and momentum, to help you identify, label and act upon those key pivotal support and resistance levels. The ProfitTrader MetaStock addon is an applied methodology used to buy bottoms, sell tops, and determine trends and trend reversals. Developed by Bressert for futures, the methodology can be applied to any market, any time frame. Starting Point is a trading methodology designed by Joe Krutsinger for traders that are new to the market and provides a base of understanding on how a good essential trading strategy may enable you to tap into the power of a mechanical trading system. Tactical Trader Advanced Trading Strategies offers THREE complete systems in ONE amazing package. Systems you can begin using today to improve your trades. Trade Oracle is a versatile trading system package that works with Stocks, Futures, Options, End-of-Day, and Intraday Trading. 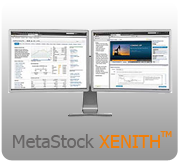 The newest MetaStock addon from Trading System Analysis Group (TSAGroup). Every system is disclosed. No "Black Box" systems.